Generally, I don't like fruits in my desserts. This is the exact opposite of Michael, he pretty much could always do with a strawberry or raspberry or some such thrown in. Where we meet in the middle is chocolate covered strawberries. Ahhh yes. Nothing better than that, really, now is there? I remember for our 1 year anniversary (which was a picnic at Chelsea Piers) we had chocolate covered strawberries that I made and they were pretty much a major highlight of the day. Now I know you're probably thinking "Yeah, Kayle, those are great. But um...we're looking at pictures of popsicles." You're absolutely right. We are. 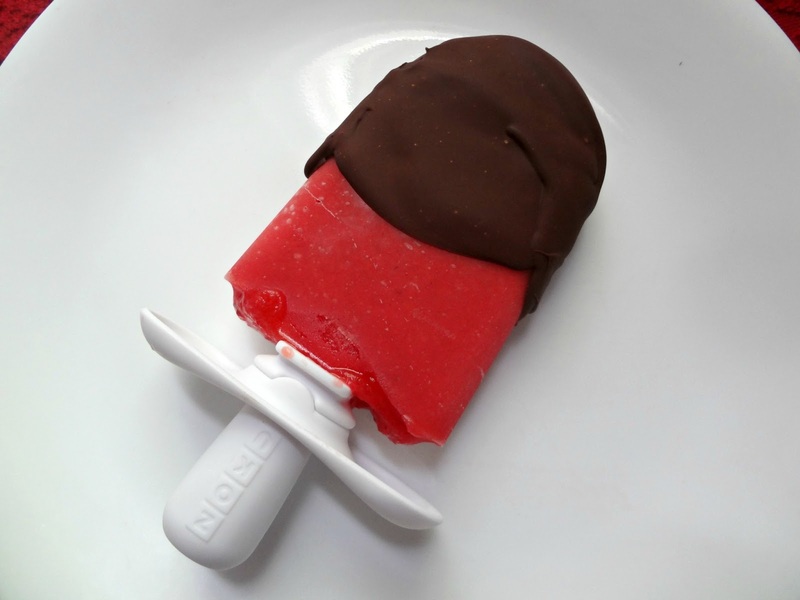 Because, thanks to homemade magic shell and the Zoku Single Quick Pop Maker, I was able to make chocolate covered strawberry popsicles. Welcome to summer. Oh hey and these popsicles are likely to be way better for you than the kind you buy at the store. We're talking just strawberries and water...and then chocolate. Yes, you can add sugar (Michael requested it), but you don't need to. They're refreshing, pretty (hello pretty pretty red color! ), and just like "ahhh." Can't you just imagine lounging by a pool, enjoying your super tasty chocolate covered strawberry popsicle? And, since it's just Michael and I, the single quick pop maker worked out perfectly. We were able to make 2 or 3 popsicles at a time, and just stored the rest of the strawberry mix in the refrigerator between popsicle uses. Also, if we made more popsicles then we wanted right then, we could just throw the extras in an airtight container and put that in the freezer until we get a hankerin' for some frozen goodness. Let's talk about the popsicle maker that made this all possible, shall we? The Zoku Quick Pop Maker (one of many Zoku products) freezes pops in as little as 7 minutes (usually it takes me around 15, but it's hot in my apartment) and is super easy to use! You just need to keep the pop maker in your freezer for at least 24 hours before using (I usually just always keep it in there), put in one of the 3 popsicle sticks your kit comes with, and then pour in whatever juice, etc. you're using to make the popsicles. Then you just wait for a little while. Once ready you use this cool, aptly named, "Super Tool" to loosen the popsicle, and you lift it out. Put on a drip guard (which also comes with it) in case you're messy, like me. And we have popsicles! Woot! The pop maker comes in red, blue, orange, lime green, or violet (like my pretty maker) and is BPA and Phthalate Free. My new best friend, guys. 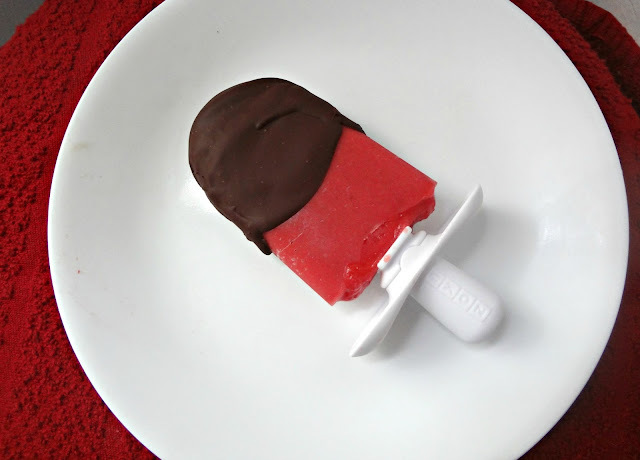 I'm having so much fun thinking of fun new popsicle ideas! 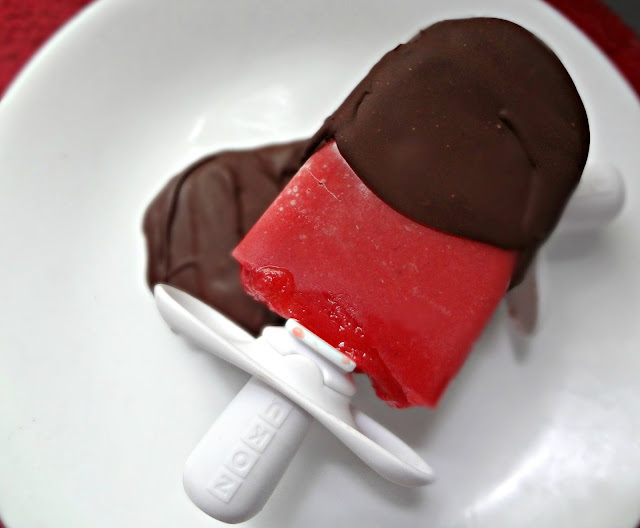 If you're looking for more Zoku pop maker info or great recipes, check out Zoku's blog, pinterest, twitter, and facebook! 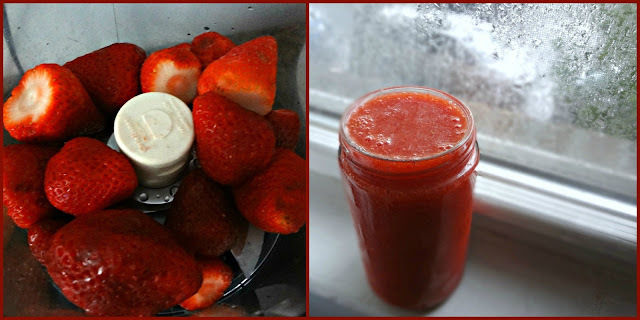 Blend together (in food processor or blender) strawberries and water (and sugar, if using). If using regular popsicle molds: pour in and freeze for at least 4 hours. If using Zoku pop maker: pour mixture into a container that is easy to pour from. Follow pop maker instructions. If using single quick pop maker, you'll only be able to make 3 at a time, so store rest of strawberry mixture in an airtight container in the refrigerator and use to make more popsicles later. 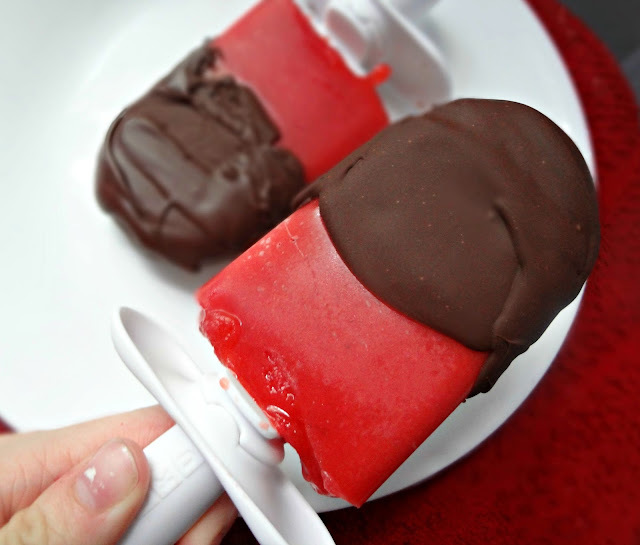 Once popsicles are frozen, dip into magic shell and serve! 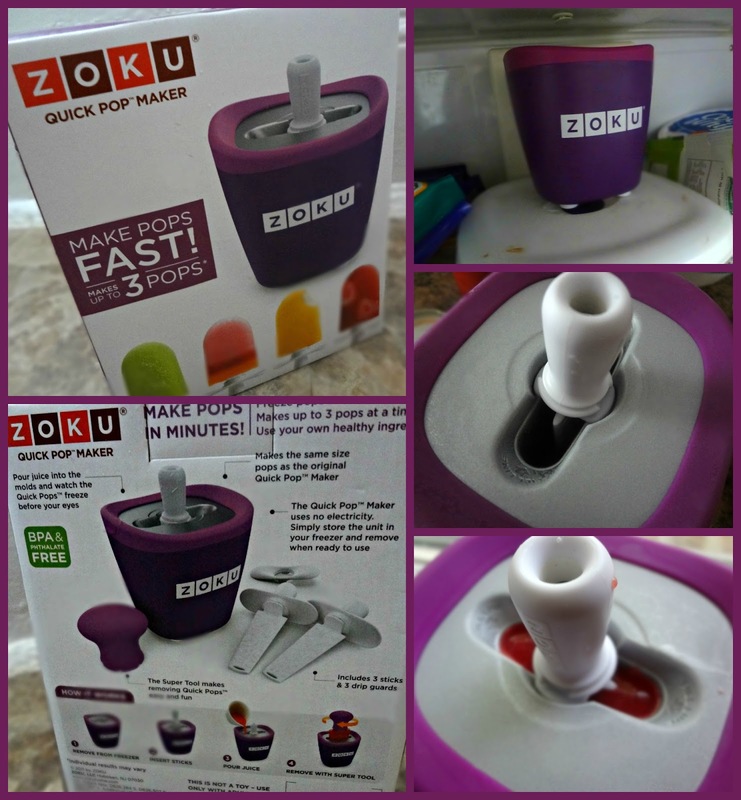 Disclaimer: I was provided with a Zoku Single Quick Pop Maker to try, but I was under no obligation to review if I so chose. Nor was I under any obligation to write a positive review in return for the free product. My opinions, as always, are all my own.